Hi, groovyReaders — I’m working on a big, big review of Box.net Business edition, but in the meantime, I thought I’d send a quick tutorial your way on one of Box.net’s best features: Zoho integration. If Google Docs has a competitor, it’s Zoho. And if Dropbox has a worthy contender, it’s Box.net. And Box.net + Zoho is a highly groovy combo. Combined with Box.net’s desktop sync application, it’s quite possibly the best solution for flexible cloud-based online document editing. For my workflow, Box.net + Zoho + Box Sync is perfect, since it gives me a synchronized local copy of each document on all of my computers that I can edit online or with Microsoft Word without having to worry about conflicting changes. The only caveat: The Box Sync client is for Business / Premium users only. Zoho, however, is free to all through the OpenBox platform. Sign up for Box.net, if you haven’t already. Box.net Lite / Personal (5 GB) is free. Click the OpenBox tab, if you are using the old interface. If you’ve made the switch to the new version (with the Box BETA logo), then Click Apps. Search for Zoho in the search box in the top-right. Click on Zoho when it appears in your search results. 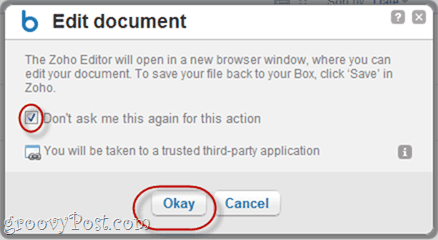 Review the notification from Box.net and Click Okay to grant Zoho access to your Box account. Obviously, this privilege will only be used for loading, editing and saving your documents to your Box.net account. Now, Zoho is added to your account. You can now edit existing documents using Zoho. 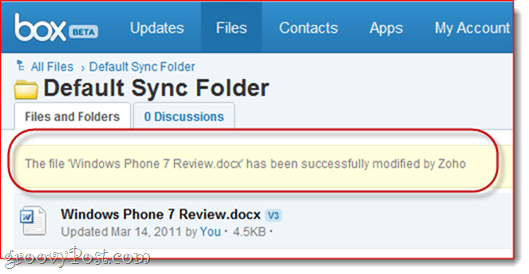 From your Box.net account, find a compatible document you’d like to edit and Click the Arrow to show available actions. Go down to More Actions and choose “Edit Document” from the list. The Zoho icon will be shown next to the option. Box.net will warn you that you’ll be editing the document in a new browser window using Zoho Editor. You are okay with this. Check “Don’t ask me this again for this action” if you don’t want to be shown this dialog box each time. 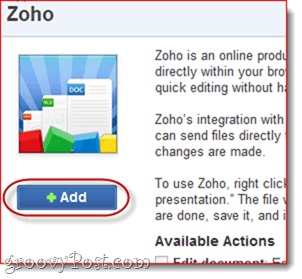 Edit your documents in the Zoho window. When you’re done, make sure you Click the Save icon. Box.net will also notify you that Zoho has made a change. And if you have the BoxSync client installed, your local version will be updated as well. Zoho Editor lets you edit and save Box.net files directly from your Box.net web interface. Overall, I find it a million percent better than the .webdocs format—plus, you can edit Microsoft Office files, which you can’t do with Box.net’s .webdocs editor. The only way this could be better is if you could automatically save files from your Zoho account to your Box.net account, for those of us who already heavily use Zoho. For that, the ball is in Zoho’s court. The Box.net team has done a great job of integrating Zoho’s API into their service. You don’t even need a Zoho account to be able to use Zoho’s powerful editor for your Box.net account, making it incredibly seamless—almost as if Zoho were part of Box.net’s native interface.